Climb the limestone rocks of Krabi, snorkel to hidden islands and encounter the rich biodiversity of Khao Sok National Park. No experience needed – just a sense of adventure! Tropical waters, secluded jungle lagoons and craggy limestone cliffs make Thailand a destination of breathtaking beauty and epic adventure. From Bangkok to Railay Bay, join us on this exhilarating expedition. 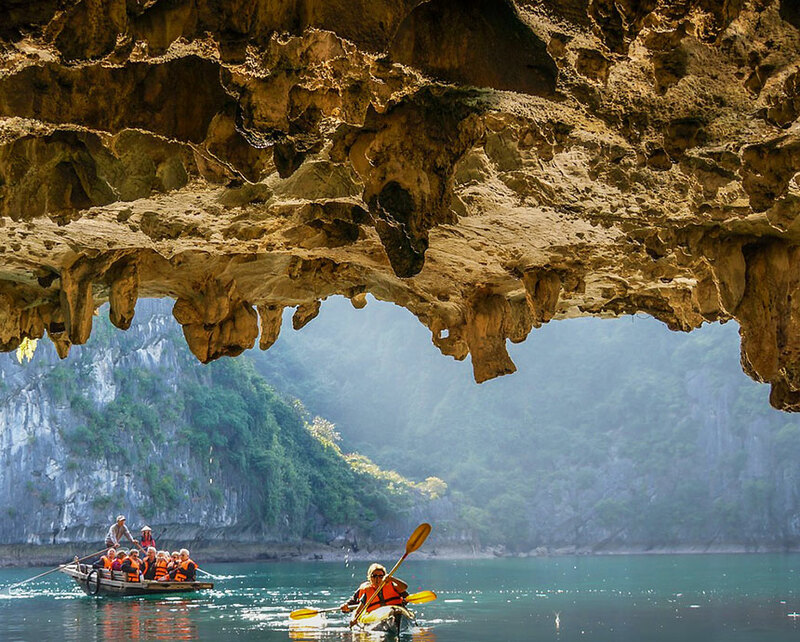 We’ll immerse ourselves in the biodiverse beauty of Khao Sok, kayak deep into mysterious caves and snorkel through vibrant depths of coral reef. Test your limits as you rock-climb the cliffs of Krabi, with white sand beaches and turquoise waters unfolding beneath you. But don’t worry if you’re a complete beginner – we can accommodate all levels of experience, from novice to expert. Then it’s time to unwind on the most pristine beaches imaginable. From delicious Thai cuisine to paradise sands, this tropical Thailand escape will inspire you with daring adventure. Beautiful coastal hotel nestled between limestone cliffs and mangrove forests. Expect traditional Thai decor infused with crisp, modern elegance. Surrounded by the epic scenery of Railay Bay, this hotel is a tropical dream come true. With an atmospheric outdoor pool overlooking the beach, beautiful rooms, intimate steam rooms and a massage parlour, experience the deep relaxation you need. Located in the hills overlooking the limestone cliffs of Krabi, this luxurious hotel will transport you to a world of tranquillity and comfort. Unwind in spacious rooms, tastefully decorated in an elegant Thai style. With six private pools overlooking the sea, this is refined hospitality at its best. 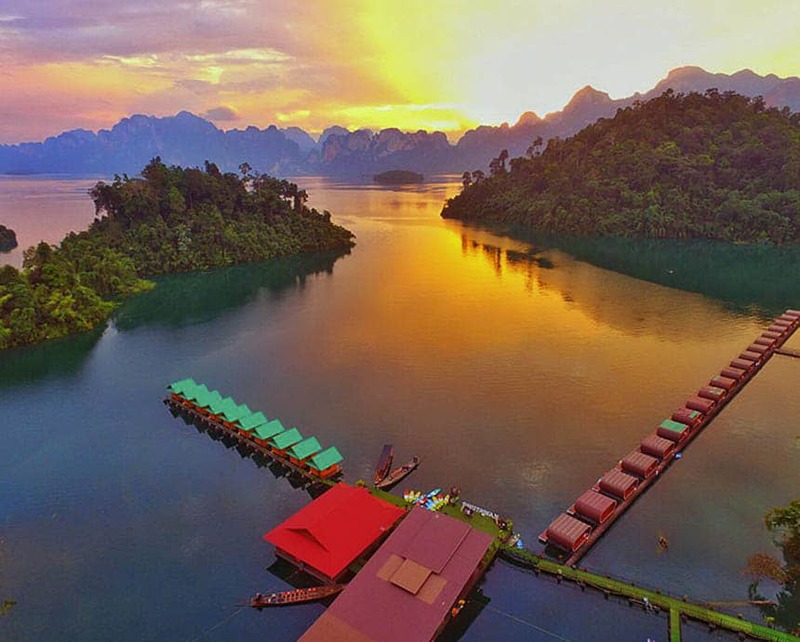 With unparalleled access to Khao Sok National Park and breathtaking views of the landscape, these floating raft houses are located at the heart of nature’s wonders. The specific raft lodges we stay at will change depending on which dates you book, but they are all of the same standard, with the same stunning views of the National Park. These floating raft houses are simple and rustic, but their incredible location makes it more than worth it. Wake up to mesmerising sunrise views over the lakes and dive in for a revitalising morning swim. Blending traditional Thai design with crisp modern elegance, this urban haven offers the perfect refuge from the frenetic energy of the city. Enjoy exclusive access to the sumptuous restaurant and bar, and be sure to unwind in the private rooftop pool with panoramic views over the city. Flashpackers, welcome to Bangkok. Step into a city of contrasts, where tradition meets modernity in electrifying fashion. An private transfer will greet you at the airport, before transporting you to your boutique hotel. Meet your fellow Flashpackers and guide, then we’ll head out for an aperitif at a rooftop bar – there’s nothing quite like the sprawling lights of Bangkok as seen from the sky. From the Chao Phraya River to the golden temples, absorb the sights of this chaotic city as it glitters with sunset. We’ll then tuck into a welcome feast, toasting to the wonderful adventure ahead. After breakfast at the hotel, we’ll check out and head out to uncover Bangkok by public transport. Experience the thrill of weaving through traffic in an open-air tuk tuk, before boarding the iconic skytrain. Then we’ll hop aboard a traditional boat to experience Bangkok’s river life. Come afternoon, it’s time to discover the city’s rich cultural heritage, from Wat Pho temple to the lesser-known Jim Thompson House. Navigate your way through an urban jungle that is chaotic and beguiling in equal measure – it will transform beyond recognition in the coming years. In the evening, we’ll board the night train, heading south to Surat Thani. It may not be the best night’s sleep in your life, but nothing says adventure like journeying through the night on a country train. Stock up on plenty of snacks and be sure to bring a pack of cards. Wake up on the train as it continues the journey south. We’ll hop off to grab some breakfast, stopping by a train station to pick up mango smoothies – and spicy noodles, for those who are brave enough. Tuck into your breakfast, as we continue the journey to Khao Sok National Park. We’ll then alight to explore our new surroundings; with dense virgin rainforest, mysterious caves and scattered islands, experience a haven of biodiversity in the heart of the national park. We’ll venture into the national park by boat, breathing in the lush surroundings and varied wildlife. After lunch, we’ll discover the national park by foot, heading out for a gentle afternoon hike. We’ll then hop back onto the boat for an evening safari, as twilight settles over the limestone cliffs. Wildlife lovers, prepare to experience the unique magic of Khao Sok at sunrise, as we set out on an early morning safari by boat. But don’t worry if early mornings aren’t your thing – this is an incredible location to explore at a leisurely pace, with some phenomenal views. After lunch, we’ll continue our journey to Krabi, a region boasting some of the finest beaches in Thailand. After checking into the hotel, get ready to expand your culinary horizons on an epic street food safari. Think crispy fish cakes, fresh papaya salads and sizzling coconut delights – and perhaps an insect or two? Absorb the tantalising aromas and colorful sights of Thai market life, seeking out its unique delicacies and foodie secrets. Limestone cliffs, sparkling turquoise waters, fresh coconuts dropping from the trees – Krabi is basically paradise on earth. We’ll head out on a kayaking adventure this morning, venturing into the waters of Bor Thor National Park. From delicate stalagmites to secret openings, discover corners of eerie beauty and mysterious geological formations deep in the caves. Then we’ll paddle our way through lush mangroves – but beware of marauding monkeys! After an action-packed morning, tuck into a feast on a traditional floating restaurant, before heading back to the hotel. The evening is then yours to spend at leisure. Take a twilight stroll through your surroundings or knock back a couple of cocktails at the hotel – it’s over to you. Today, get ready to dive into the tropical depths of Railay Bay as we head out on a snorkeling safari. But not until we’ve checked out the paradise sands of Phi Phi Island, a pearl in the Andaman Sea. We’ll then speedboat over to the secluded shores of Bamboo Island, to encounter its perfect white beaches and blossoming coral. After lunch on Phi Phi Don, we’ll continue to Monkey Beach to meet its cheeky inhabitants. As we weave between the islands, there’ll be plenty of opportunity to disembark into the water; snorkel through clear blue seas at a chilled pace, encountering the abundant coral and tropical fish beneath the surface. Then lather on the sun cream and kick back in the tropical rays – it’s time to work on that tan. On the way back, we’ll pick up our luggage and head over to our beach hotel: the perfect place to unwind. After an action-packed itinerary, today is yours to spend at leisure – and what an incredible location to explore at your own pace. From local cooking classes to phallic Hindu shrines (it is exactly what it sounds like), Railay Bay is brimming with curiosities and cultural treasures. Seek out secret lagoons hidden deep in the rainforest, discover dark caves filled with bats or hit the sands for a deep chill. Seek out the island’s hidden nooks and secluded coves for an off-the-beaten-track sunbathing experience, with only the cheeky monkeys to disrupt your peace. With a good book and a cold beer, you’ll forget you ever have to return to the real world – this is the relaxation you deserve. Prepare to release your inner daredevil this morning, as we ascend the epic limestone cliffs of Railay Bay. But don’t worry if you’re a complete beginner – from novice to monkey-in-disguise, our expert guides will accommodate all levels of experience. Discover the rugged beauty of the karst stone up-close, working with its textured surface in your chalk-powdered hands. Flex your muscles as you pull yourself up the cliffs (perhaps with a little help from your belayer), then absorb the truly spectacular views from the top – your hard work was well worth it! Return to solid ground and crack open the cold beers, energized with the buzz of learning a new skill. Come evening, we’ll head out for a final feast, celebrating the incredible adventure we’ve had. Thailand, it’s been epic. You’ve discovered the artistic heritage of Bangkok, experienced the biodiverse beauty of Khao Sok and ascended the limestone cliffs of Railay Bay. It’s now over to you to make your own way to your next destination. Not quite done with Southeast Asia? 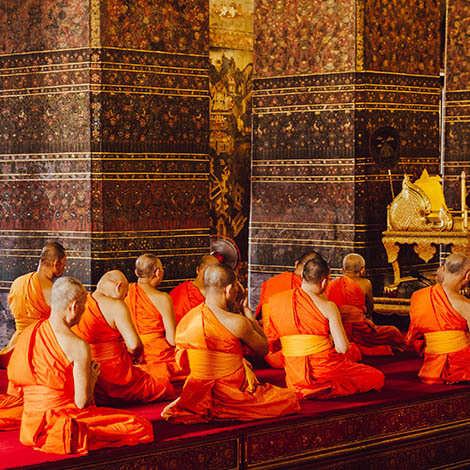 Join us along the Mekong with our trip to Thailand and Laos. Wherever you’re heading next, it’s been a wonderful adventure. Fly into Bangkok Suvarnabhumi Airport and we suggest you fly out of Krabi International Airport as it is the nearest airport to where we finish the adventure. Please try to arrive before 3pm on day 1, although we will arrange an airport transfer for you at whichever time you arrive. Depart at your own leisure anytime on day 9.